Being part of a homeschool group has so many wonderful benefits. Little did I know that it would benefit my garden one day. 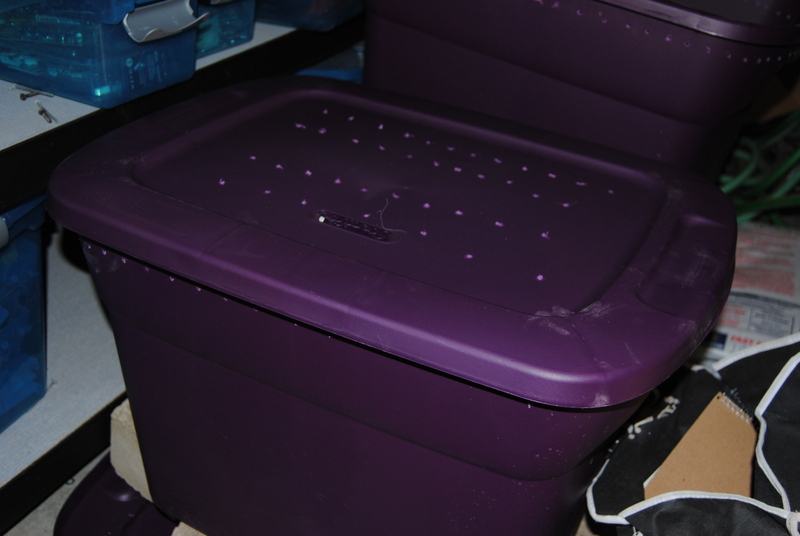 One of the homeschool moms shared a link to this website which gives instruction on starting your own worm bins. Hubby had expressed his desire to one day start vermicomposting, but decided we should wait until we move to our homestead. 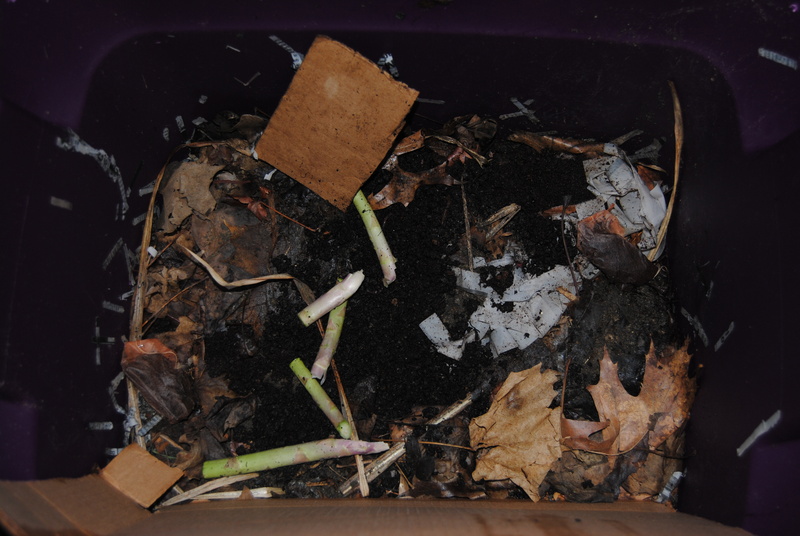 Since that isn’t happening in the foreseeable future (more on that in another post), why not do a little vermicomposting now. After all, it’s part of science and my girls are all about science. And math skills come into play. Then there’s reading about vermicomposting. Okay, it’s a well-rounded educational experience for the girls and it will one day gives us rich black soil for the garden. It’s a win-win. The mom who posted the website also found a place to order redworms for a very reasonable price. I did a little research on my own to get the cost of redworms and holy cow!!!! Who knew worms could cost so much!!!! I discovered I was getting a very good deal and suddenly found myself excited about worms. I purchased our containers (18 gallon instead of the 8-10 gallon containers suggested). Worms reproduce quickly, so I’m sure they will be fine in a larger container. Hubby drilled the holes, I shredded and wet down the newspaper, put in some leaves and dirt then we were ready for worms. The worms arrived yesterday and in they went. Approximately 500 wiggling, squirming worms. They had been in such tight quarters that they had wrapped themselves around each other. Nothing more than a big ball of redworms and I was ecstatic to have them in my garage. 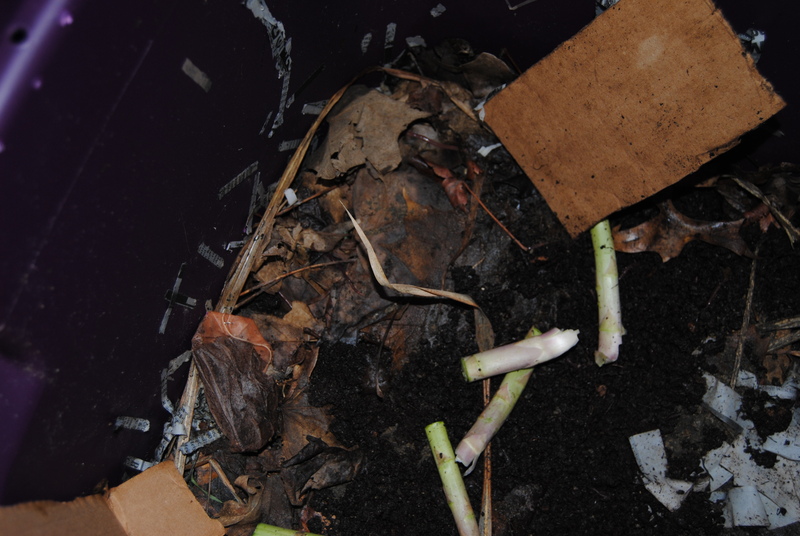 I carefully helped separate some of them, put in some asparagus stems, coffee grounds and tea bags, then covered them with wet cardboard. The container lid went on and they were left to begin their work. In my excitement, I neglected to take pictures of the worm ball. I did go take pictures this morning and unless the majority of worms have escaped, they have dug their way down into the wet newspaper and are diligently turning everything into soil. I did get a picture of one worm this morning. Can you find him? It may be easier to spot him in this photo. And here is what I see every time I enter the garage. Now, I wonder how long it will take these worms to make me some dirt? I took a brief look at the website and will be going back to look in much more detail. Thanks for sharing it with me.